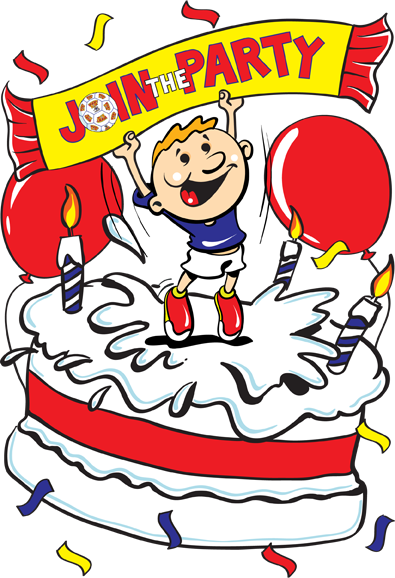 Why not book one of our popular Footytotz™ birthday parties for you little one. Parties can be booked during the week, at weekends and during holiday times. Our staff may be able to help you find a suitable venue and once the venue is booked, all you need to do is send out the invitations to your guests, (provided by us) organise the food, and we will do all the rest. We also provide you with ‘well done ‘stickers, a birthday card, and balloons. An experienced programme leader will come to your venue and entertain up to 22 children up to the age of seven years old. The children will take part in some specially designed Footytotz™ activities before their party food. The fun then continues whilst you are clearing up the room. The cost of a 2 hour Footytotz™ Birthday party is £122.00 for up to 22 children. For a further cost of £30.00, why not invite our full size mascot to make your child’s Birthday party even more memorable? 1. Children at parties must be supervised by parents or other responsible adults at all times. Please make sure you have at least one adult for every five children. 2. Parties need a minimum of eight children . 3. Footytotz™ Birthday Parties are available seven days per week. 4. A non-refundable deposit of £20 or 20% of the total cost (whichever is greater) is required on booking. The remaining balance must be paid in full 5 days before the day of the party. Cancellation following payment in full will be refunded at 50% of the total cost. 5. Party venues must be booked by you. The venue must be of suitable size for a Footytotz™ session. 6. The venue must be clean, safe and floor areas checked for any sharp objects. Footytotz™ will not be responsible for any damage made to the venue by a member of the party. 7. A Footytotz™ party is booked as an exclusive to you. 8. Please tell us if any members of your party have special needs. 9. It is the responsibility of the party organiser to obtain consent from all parent/guardians of the children attending the party before taking any photographs or video footage. 10. Any food required must be organised by the party host.